Pro 14 side Leinster have reportedly recieved an ultimatum from the IRFU: to keep either Joey Carbery or Ross Byrne. Ulster are in desperate need of a fly-half in the wake of revoking Paddy Jackson's contract, who has been linked recently to Sale Sharks. A couple of rumours involving the Top 14 club Stade Francais have surfaced... they have approached Carl Fearns with a figure nudging £70k a month for his services. 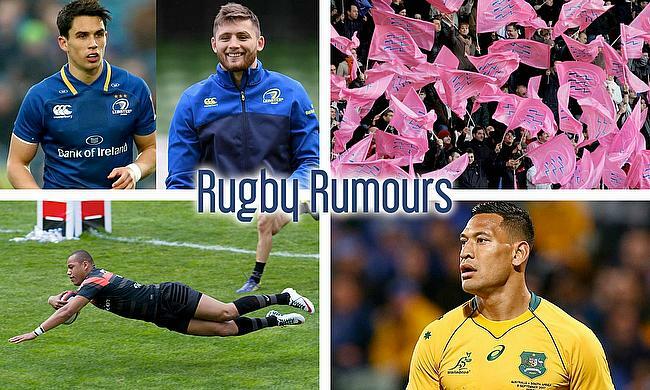 They are also after a number 10, as well as talks of Danny Cipriani circulating, they are also trying to lure in Argentina and Jaguares fly-half Nicolas Sanchez. If you haven't heard this story, you're lucky, and we're you've been the past week!? Sale Sharks have made a play for the Australian international Israel Folau. Sale are never far from a controversal signing or a rugby league convert, so their approach for the Waratahs full-back shouldn't be surprise to too many from that point of view. The French centre Gaël Fickou is set for a inter-Top 14 move at the end of the season, although he's currently still contracted til with Toulouse until 2019. Racing 92 have made a bid for the 24 year-old (who has already racked up a respectable 35 caps for his country), and are putting €850,000 on the table for his services.